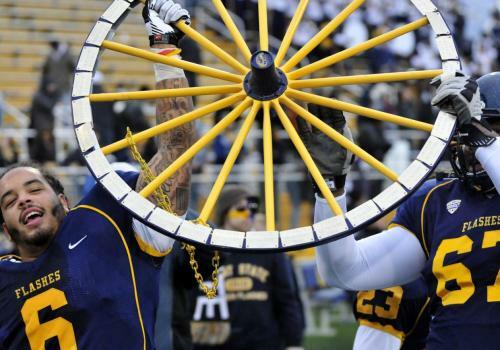 Kent State kept the dream alive for another week, using the ground-and-pound offense to beat Akron, 35-24, and retain the Wagon Wheel for the third consecutive year. The Golden Flashes were led by Traylon Durham, who finished with 107 yards rushing and three touchdowns, including the clincher on fourth-and-1 with 15 seconds left in the game; and Dri Archer, who ran for 126 yards and scored a touchdown. On the day, Kent State rushed for 261 yards, five touchdowns and an average of 6.5 yards per rush. The win is Kent State’s seventh in a row, the team’s best winning streak since 1940, and runs their record to 8-1, 5-0 in the MAC’s Eastern Division. The eight wins are tied for the second-most in school history and this is the first time the Golden Flashes are 5-0 in the MAC. The Golden Flashes have also won 12 of their last 14 games dating back to last season. It wasn’t all fun and games for Kent, however, as the Zips jumped out to a 14-0 lead in the first quarter as the Golden Flashes were apparently still thinking about last week’s win against Rutgers. Akron had scoring drives of 89 yards and 70 yards in building the early 14-point lead. Following Durham’s first touchdown run that cut the lead to 14-7, the Zips went 94 yards to push the lead back to two touchdowns at 21-7. The Zips would roll up 442 yards of offense and convert eight-of-16 third downs as they obviously found something to exploit in the Kent State defense. But while the Golden Flashes gave up yards, they held the Zips to just three points over the final 33 minutes of the game, giving the offense time to get its act together and pull out the win. In the second half, Akron had eight possessions – five ended in punts, one ended in a fumble, another ended on a failed fourth down play, and the final one ended with the game. Even though they put up big numbers in the rushing game, the Golden Flashes still struggled on offense, converting just 3-of-11 on third down. For the season, Archer (a junior) has rushed for 892 yards, a 9.2 per rush average, and scored a combined 16 touchdowns (10 rushing, three receiving and three on kickoff returns). He also has us picturing him in Orange and Brown on Sundays. Durham (a sophomore) has added 887 rushing yards and 11 touchdowns. Kent State travels to Oxford next Saturday to take on Miami, which was upset by Buffalo on Saturday, as the Golden Flashes try to earn their first bowl bid since 1972.